Major Eric Egland, the founder of Troops Need You, writes today at National Review Online on the shifting focus back to Afghanistan as the war in Iraq winds down in victory. 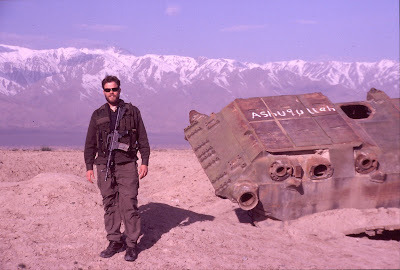 Major Eric Egland in the Afghanistan mountains. Prudent adaptability and the raw will to win remain vital ingredients of a successful military effort. Over the next six months, President Bush will likely empower General Petraeus, as commander of U.S. Central Command, to apply to Afghanistan the counterinsurgency principles that have worked in Iraq. Soon enough, though, the next commander-in-chief will be in charge of the fight — and he will need first to lead with the will to win and second to exercise the wartime judgment that can adapt to a dynamic insurgency. On the first point, both presidential hopefuls have made statements expressing the need to win in Afghanistan — a positive sign, as far as speeches go. Each has expressed his support for additional troops to contend with Afghanistan’s porous borders, challenging terrain, and dispersed population. There is little doubt that McCain has the will to back up his rhetoric; but Obama’s dedication to the task remains in doubt, especially if things were to get tough and public support were to wane, as it did in Iraq in 2006. Today, Obama speaks as if a surge in Afghanistan were his own idea. (Sen. Joe Lieberman, a McCain ally, deserves credit for that.) But if public opinion were to turn against an Afghan surge, it is easy to imagine Obama pulling the plug on the operation before the mission was completed. One can almost anticipate the familiar rhetorical moves: He could blame his favorite pincushion, President Bush — but also General Petraeus, the man behind the very success in Iraq that Obama refuses to acknowledge. On the second issue, Senator Obama claims better wartime judgment because he, as a state legislator on the South Side of Chicago, opposed the Iraq War from the start — as did the overwhelming percentage of his constituents (hardly a profile in courage). In January 2007, Senator Obama said the surge would worsen security in Iraq, and unveiled a plan to withdraw all forces by March 2008. Had we followed Obama’s wartime plan, Iraq would be in chaos and the U.S. would be tearing itself apart arguing over how we could have lost a war without losing a decisive battle — Vietnam all over again. Worse, Al Qaeda would have achieved two strategic goals: defeating the U.S., and establishing a new base of operations from which to plan, finance, and train for a new wave of 9/11-style terror attacks. In sharp contrast with Obama’s wartime judgment, Senator McCain called for the new, effective approach in Iraq a full year before even his own party supported the idea. McCain faced broad criticism when he first called for a new strategy — yet he held firm in his conviction that we must adapt to today’s insurgencies, and eventually brought others along to his way of thinking.